Take a trip into an incredible history of impeccable quality and style with Filson. A sign of true luxury and expert craftmanship since 1897, this Seattle based company has specialised in superior products of unmistakable quality and durability which are quite often handed down through generations. Originally set up as a small loggers outfitting store, C.C. Filson soon realised that thousands of fortune hunters were heading north as a result of the widespread 'Gold Rush'. Armed with strong work ethics and a reputation for honesty and years of experience, C.C Filson soon realised the potential of providing these people with hardwearing apparel; and so Filson was born. Still produced in the USA today, Filson pride themselves on rugged quality and innovative design, infusing each design with the pioneered spirit and love of the great outdoors. Only the very best materials obtainable are used, guaranteeing a lifelong wear and undisputable quality whilst providing inimitable style. We boast a stunning array of bags and accessories, from duffel designs to field bags and everything in between, all encompassing the longstanding heritage of the brand and executing them in incredible style. With strong earthy colours and robust fastenings, in addition to practical pockets and incredibly comfortable straps - it is no surprise that this incredible company are one of our most loved brands within our accessories collection. From the city commuter to the countryside rambler, there is a style to suit all...with unrivalled quality and a historical backbone stitched into every piece. Discover the expertise and style of Filson bags and accessories. 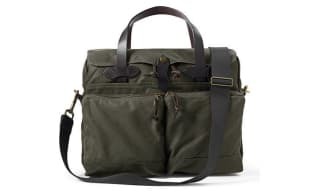 Shop for Filson bags & accessories online. This selection of Filson luggage encompasses a whole range of Filson bags from duffles to field bags and with so much in-between. Established well over 100 years ago American brand Filson are still committed today to providing top quality products built on a heritage of expertise and excellent craftsmanship. Encompassing a range of hardwearing fabrics and durable detailing, this selection of Filson bags & accessories stands true to the brands original philosophy born over a century ago. Well, it's not surprising that what worked then still works today. As Clinton C. Filson said in 1914, "Comfort, durability and protection never go out of style." This handpicked selection of Filson clothing presents a new take on durable outerwear with tightly woven yarns and waxed fabrics featuring heavily. Still crafted in the USA today Filson products are built to satisfy and built to last. Clinton Filson said in 1897, "Your satisfaction is the sole purpose of our transaction" and this is a statement which still stands true to the brand today. Filson’s Tin Cloth is a thick cotton canvas milled by century-old mills in Scotland, coated in a Filson proprietary oil-finish wax. The wax dissipates over the years — or a season or two of heavy use — re-apply a coating to get reinforced, uncompromising protection from brush and rain. Filson have applied their Tin Cloth fabric to their range of clothing, bags and accessories. Shop the Filson sale online. 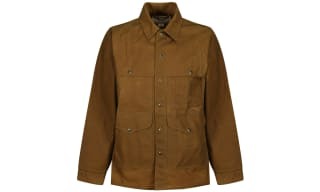 We have a great range of Filson bags & jackets on sale at Outdoor and Country. 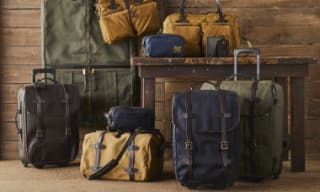 This great range of Filson is now available to order at outlet prices that shouldn't be missed. With over 100 years of experience in creating rugged quality Filson bags and outerwear are renowned worldwide for their pioneering spirit and love of the outdoors. 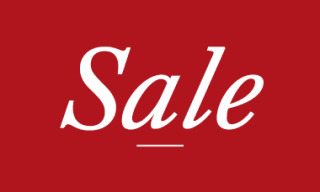 This selection of Filson sale presents exactly that but at truly unmissable prices. Whatever style it is that you're looking for, be sure to check out this Filson sale selection first to see if you can find your favourite for less, here at Outdoor and Country.